Those looking for a low-priced handset in India could make a nice pick-up with the Nokia Lumia 630. The Windows Phone powered handset is now being offered for the equivalent of $95 USD in the country. The deal is offered by online retailer Flipkart. The Nokia Lumia 630 comes with Windows Phone 8.1 pre-installed, and features a 4.5-inch screen with resolution of 480 x 854. 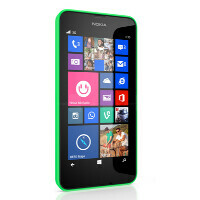 The Nokia Lumia 630 is driven by a quad-core Snapdragon 400 CPU with the Adreno 305 GPU crunching graphics. 512MB of RAM is on board along with 8GB of native storage. Those who need more memory can use the 128GB capacity microSD slot. The 5MP rear-facing camera does not have a flash, and there is no front-facing snapper. An 1830mAh battery keeps the lights on. The model is an entry-level device for those who don't need all the bells and whistles. It also is a good choice for those purchasing their first smartphone. There's no word from Flipkart as to how long this deal will be available, so if you are interested in taking advantage of the discount, you might want to get your order in now. A snapdragon 400 with 512 MB ram. Completely Wasted potential. $95 is a great price. I love clear black display. 638 is nice but way too costly compared to the price tag of 635($95). There isn't no point in making phones with 512 MB ram in 2015. At this price and specs android can't give smooth performance. Android can give good experience if the spec is high. But this price and Specs, WP gives smooth performance. If i have to choose a mid range or low end phone, I will choose WP only. this is not 2012 so stop giving that old argument .. low end androids have evolved and are as smooth as wp See Moto E and Android One phones and other phones ..
nop they are not smooth as wp i own s4, s3. htc one m7 and lumia 620 i can prove that. His point is completely valid. I'm using WP now & I've owned many phones. Also I've used recent Android low end phones especially Moto's they are definitely as smooth any WP I've used. No its not, the majority of Androids at the price point of cheap Lumias offers nowhere near the great user experience as WP. No they're not do you realize just how many cheap Android phones they're are out there only few OEMs thus far has signed on to Android One. The funny thing about Android one is that it betrays typical Android gone are the customization instead its just pure like WP just not as nicely coded. Except stock android, all other low end android lags. My mid ranger T2 ultra which released in 2014 lags. WP is better than stock android. Same person singing the same song. I playing with a Nepture Pine that has 512 MB ram running jelly bean 4.1.2, its still smooth. If fact i am quite shock that 512 MB for Android is still that good. For general use there no different from my high end Android device. The only different is the graphic intensive game. See you in 2015, i guess you will be singing the same old song. 512 MB is 2015 can't get more pathetic than that. Show us Android running smooth on 512 Mb. Show us the evidence. There a media channel call youtube. Search it yourself. Oh I forgot no official youtube app in wp8. Pathetic again. I'm currently using the dual sim variant, and I like it a lot. It's reliable and the battery backup is very good. I loved Android, but I'm a WP guy now.